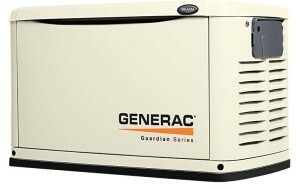 Peace of mind, all year long with a Generac generator. Greenwich Power Systems is the leading generator dealer in Fairfield and Westchester counties. 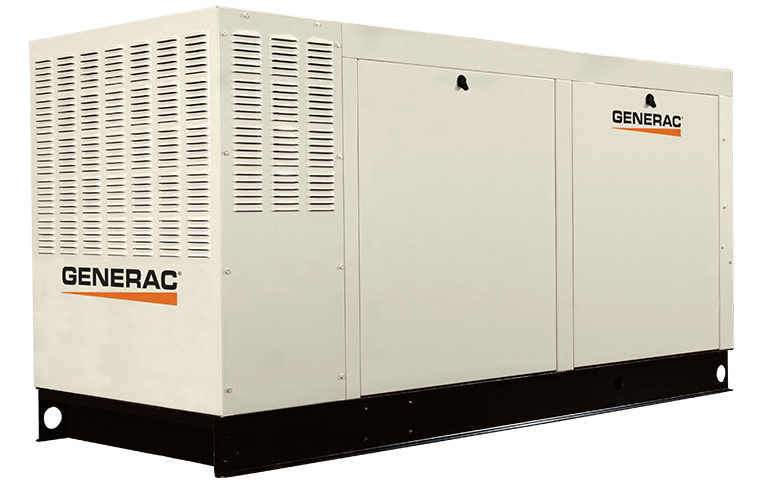 We sell, install, maintain and service all of the Generac Air-Cooled and Liquid-Cooled generators from the small 7kW through the powerful 150kW with all models in between. Whether you need LP, Natural Gas or Diesel to run your standby generator we will size the right one for your needs. Call directly for a fully turnkey solution to your standby power needs. 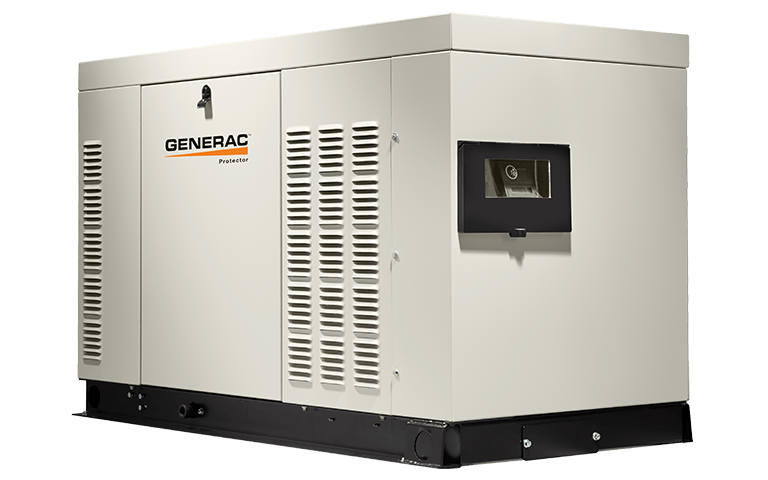 Big brother to the 6 & 7kW Generac generators this little powerhouse will be there when all you need are the essentials to get you through the storm. With a 50 Amp 10 Circuit Load Center ATS this affordable automatic unit offers protection for your home and your family at a great price. When combined with a pre-wired transfer switch, re-engineered connection points, and composite mounting pad that eliminates the need for a poured concrete base (unless specified by local codes), the Guardian Series 8 kW generator is easy to install. In areas with low natural gas pressure, the Guardian Series 8 kW generator can operate on natural gas pressures of only 3.5” of water column. Our durable powder-coat finish helps make the sturdy, Galvanneal steel enclosure perfect for all weather conditions. It’s also able to withstand 150 mph winds. Standby generators require a short run-time periodically, known as exercise, to test and ensure the system is functioning properly and ready for an emergency. The Guardian 8 kW self-test runs for only twelve minutes. Choose your schedule – weekly, bi-weekly or monthly. With the ability to back up your 2-ton air conditioner, your sump or well pump and water heater this may be all you need to see you through the next power outage. Combined with a smart transfer switch to manage multiple loads the 11kW might be the perfect choice for peace of mind. When combined with a pre-wired transfer switch or Smart Switch, re-engineered connection points, and composite mounting pad that eliminates the need for a poured concrete base (unless specified by local codes), the Guardian Series 11 kW generator is easy to install. In areas with low natural gas pressure, the Guardian Series 11 kW generator can operate on natural gas pressures of only 3.5” of water column. Our durable powder-coat finish helps make the sturdy, Galvanneal steel enclosure perfect for all weather confitions. It’s also able to withstand 150 mph winds. Optional aluminum available, recommended for salt-air locations. Standby generators require a short run-time periodically, known as exercise, to test and ensure the system is functioning properly and ready for an emergency. The Guardian 11 kW self-test runs for only twelve minutes. Choose your schedule – weekly, bi-weekly or monthly. 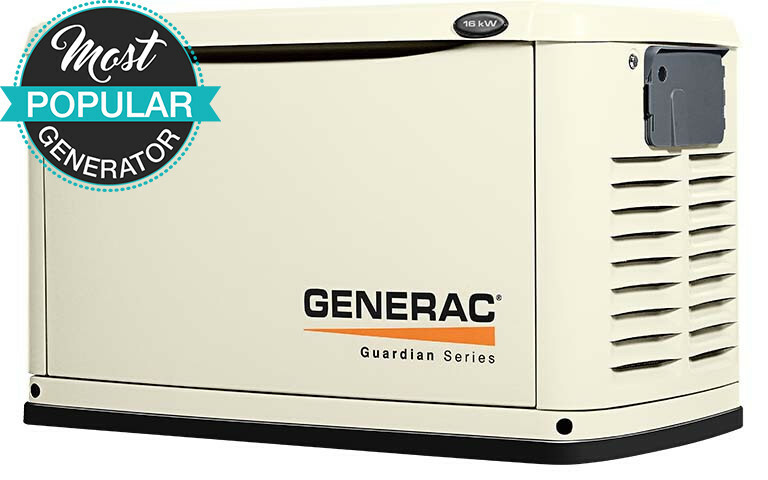 This standby generator provides critical circuit power protection for your home, ensuring the necessities remain powered during an outage or up to whole house coverage when paired with one of Generac’s load- shedding switches. Quiet yet powerful. A true whole house solution with a variable speed motor that does the job, quietly! Using its patented G-Flex technology that allows it to run a slower speeds when loads are lighter, this unit will use less fuel and make less noise and deliver cleaner power for modern electronics and sensitive applicances. The 22 kW home standby generator is the largest air-cooled home standby generator on the market. It delivers all the features and functionality customers expect from the market-leading brand of home standby generators. When combined with a pre-wired transfer switch or Smart Switch, re-engineered connection points, and composite mounting pad that eliminates the need for a poured concrete base (unless specified by local codes), the Guardian Series 16 kW generator is easy to install. In areas with low natural gas pressure, the Guardian Series 16 kW generator can operate on natural gas pressures of only 3.5” of water column. Our durable powder-coat finish helps make the sturdy, Galvanneal steel enclosure perfect for all weather conditions. It’s also able to withstand 150 mph winds. Optional aluminum available, recommended for salt-air locations. 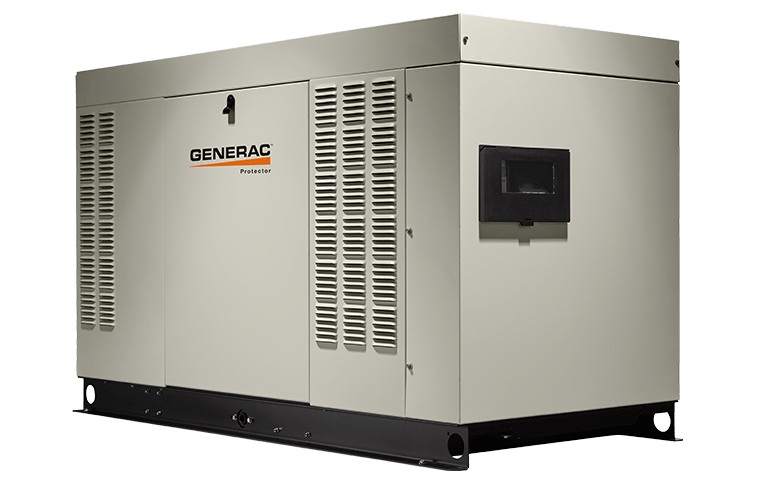 The first liquid-cooled generator in the Generac lineup. The 25kW for a larger home or possibly one with more things than usual to power up. Liquid cooled units will run longer with less stress for a bit more in price. When your home or business needs just a little more power to get through the next disaster the 27kW Protector Series might be just the right choice for you. Quiet operation with a smaller footprint, sophisticated but intuitive controls make this a great choice when a solid, reliable power plant is needed. A workhorse with a 32kW kick, the Protector Series 32kW is there when more power is needed. With 2-line multilingual Digital Evolution Controller and True Power technology this mid-range standby power plant will do the job when smaller units are just not enough to get your family or business through that dark night. A low speed high output premium generator that checks all the boxes whether at home or business. Whether NG or LP these big boys power some of the biggest homes or your most important business needs. A substantially quieter engine that uses less fuel, you’ll hardly know you have one until the need arises! Aluminum, all-weather enclosure optionprovides substantial protection from the elements. Aluminum’s corrosion resistance prolongs the life of your generator. Recommended for salt-air, coastal communities. Sturdy galvanneal steel enclosures are coated with a durable powder-coat finish for added weather protection. It may say commercial in its name but this might be just what is needed for a big house or business in outage prone area. 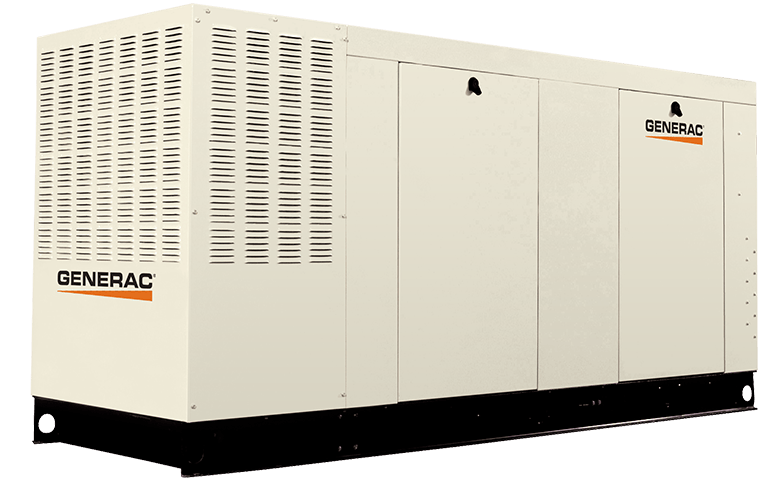 A premium grade generator with an automotive engine at its heart this large power source will provide a safe haven for your family or a competitive edge in your business. A high powered premium generator with low speed RPM. Power your home and keep your and keep your family safe, secure and comfortable. In general, live the lifestyle you normally do while the power company figures out what went wrong. A premium choice for 24/7 power and security. A high powered unit with an automotive style with a low RPM mode for quite service. Large homes require large power sources and the power provided by the 130kW will keep most large homes powered as if nothing happened. Provide service, safety and security where you need it. Your family and home come first. This powerhouse will give the largest homes a secure, safe and pleasant experience when Mother Nature or the power company make life hard. With over 600 Amps of power there’s not much this titan can’t power in the home. A premium choice for 24/7 power, security and comfort.